Pinkadots Elementary : Stressful Peek at My Week! Stressful Peek at My Week! Hello Friends, I am linking up today with Mrs. Laffin's Laughings, the linky that I have a love/hate relationship with. I feel fine with my plans until I start writing about them and see how much I need to get through. I must admit I am stressed out as I look over my lesson plans for the week. We are starting our NEW state (SBAC) tests, have a field trip, and have to get report cards ready...ALL while waiting to see if we are going to get hit with a blizzard. I am really done with snow. We had a few nice days here in Connecticut that seemed to melt most of the snow away, but lately the temperature has been below freezing almost. I just want Spring!!! Since report cards are going out in the next few weeks and parent/teacher conferences are coming up, we are working on finishing up a lot of projects in the classroom. 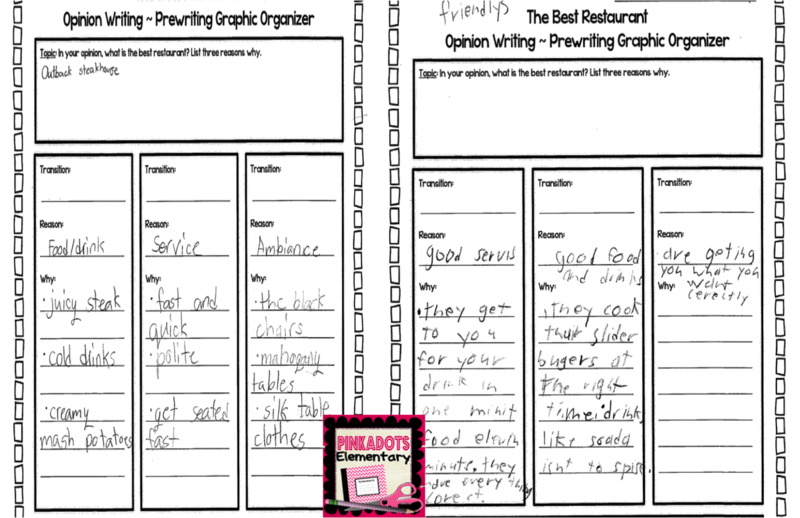 We are going to finish, peer edit, publish and SEND our "My Favorite Restaurant" opinion pieces this week. The students begged me to send them to the restaurants in hopes of getting something in return. They are going to spend some time on the I-Pads researching information about where to send their essays when they are complete. I'm hoping for a reply from the local restaurants at least! I actually purchased this opinion packet from Lisa Lilienthal's TPT store over a year ago and forgot about it. It has everything you'd ever need to create this essay with your students. As you can see we have a lot of work left on this piece. I scanned these plans in through the copy machine and will show them to the students on Monday. (My students all agree ahead of time to let me use their work to teach the class. I never use it to embarrass students and it is always anonymous, unless the student yells, "Hey, THAT'S MINE!" or "Ooops!") Student A: (on the left) followed directions and made a helpful and correct plan. Student B: (on the right) needs some help with this plan because it will not help him when it comes time for writing. Looking at the plans this weekend, also allowed me to form a small group, of students who need to REDO the plan, on Monday. We work a lot on note taking with bullet points so that is a must for a quick and efficient planning. We will also be finishing our novel, Riding Freedom, at the perfect time! The last project in my Riding Freedom unit is to create a board game based on details from the book. This is a great low-stress activity to complete during state tests. I think the students are going to have fun and use a ton of skills while creating their game. My students have been working on idioms for a while now and it is time to take our test on Thursday. We've been playing, "I have, who has" with Jivey's idiom matching cards, which is included in this Educents Bundle and the students LOVE it. They literally ask to play throughout the day. Since I have two classes, I time them both. I write the best time out of three tries on the board and the other class tries to beat it. We will have a winner at the end of this week. It started off taking the classes SIX minutes to go through around fifty cards and now it is just over THREE minutes for each class. My favorite part is hearing the students use idioms in their everyday discussion. They are so creative. 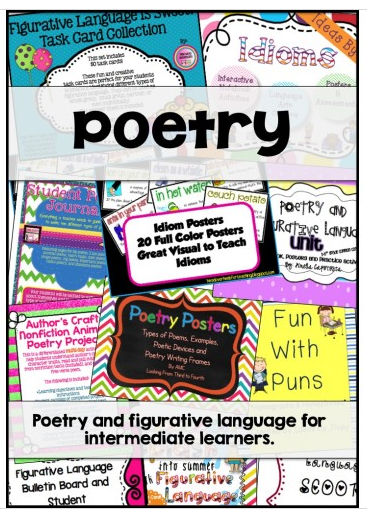 Seriously if you haven't scooped us this awesome Poetry Packet yet, you need to! 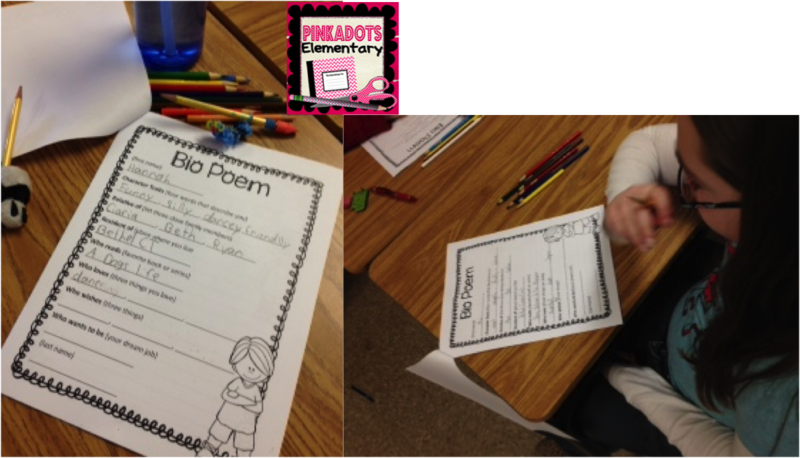 Oh yes, we also need to finish writing, proof reading, and coloring our poetry journals. We consider this fun work, so the students get to work on it as a reward for finishing other activities. We are going to give them to parents at conferences in a few weeks. They are ALSO included in the Educents Bundle! 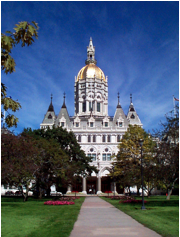 We are headed to the State Capitol Building to take a tour for our field trip this week. It is seriously beautiful and there is SO much history involved. We do a ton of walking and even get to take a picnic lunch out on the lawn. We also walk across the street to see the Colt Firearms Museum. Kind of an odd place to take fourth graders, but it is full of American History. I have a lot to do in a short amount of time (I feel like I say this a lot), but I am pretty confident we will get through it. I also want to start my new book clubs. How do you hold book clubs in your classroom? Are there any great books the students LOVE? I want something they haven't read yet, at a 4th grade reading level, and age appropriate. Any advice or tips will be appreciated. We are going to start NEXT Wednesday and cycle through two groups each (a push in reading support helper and myself) for thirty minutes each. I'd like to devote Wednesday to book clubs for the rest of the year. Flora and Ulysses, The One and Only Ivan, and Escape from Mr. Lemoncello's Library are all pretty new and great for fourth grade book clubs! I think it's funny one of your kiddos put "cold drinks" as a plus for their favorite restaurant! LOL! I can feel your stress about writing about your plans. I feel it too with my plans -- but I always feel so much better knowing that I have a full week because it makes time fly. I love your restaurant critique activity. Taking notes in bullet points is such an important skill, but can be difficult to teach. Thanks for sharing this idea! Have a great week & thanks for linking up! Oh my goodness...with all that you have going on...I declare mental health days all around. Field trips, state testing, report cards and a blizzard. You are my hero!!! !